A classic style website was required for a very classic product. 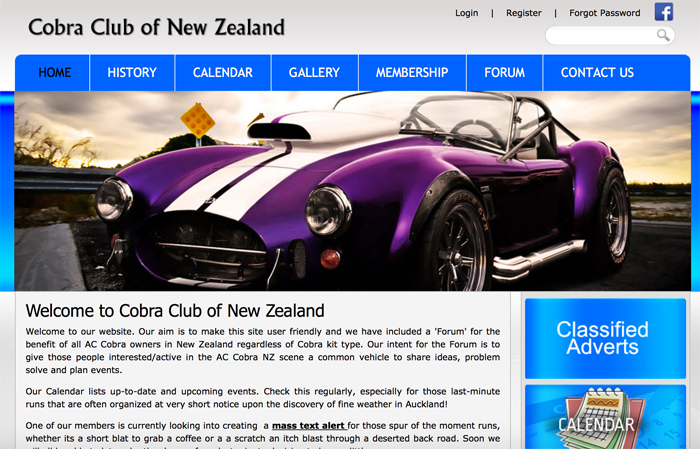 The Cobra Club of New Zealand required a traditional style website requiring a forum, calendar of events and of course a gallery showcasing these incredible cars.
" Just wanted to say thanks for all of your help in setting up our website. You and your team have done a wonderful job and the one on one time you gave to get our administrator up to speed was fantastic. There is nothing better than dealing with a local who can really understand our issues. I'm happy to recommend you to anyone. Thanks again, cheers Stu, Cobra Club of New Zealand. "